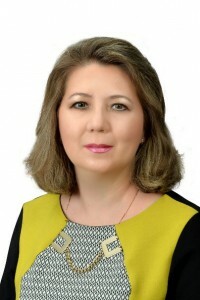 Head of the Department «Engineering entrepreneurship and marketing» of the faculty of engineering Economics and management of Karaganda state technical University, doctor of Economics, associate Professor, certified business coach of NLP and coach ICU, holder of the international scholarship of the President of the Republic of Kazakhstan «Bolashak» (2005), member Of the Association «Bolashak», winner of the Republican grant «Best teacher of the University» in 2014, experience of teaching-20 years, including as head of the Department-9 years. In 1993 she graduated from the Karaganda order of the red banner of Labor Polytechnic Institute (now Karaganda state technical University). Specialty: «Economics and management in mechanical engineering» (diploma «with honors»). From 2006 to 2009 she studied at the doctoral program of Moscow state University. M. V. Lomonosov at the Department of economic theory of the faculty of public administration (within the state scholarship program of the Republic of Kazakhstan «Bolashak»). In 2010 she defended her thesis for the degree of doctor of economic Sciences, specialty 08.00.01 — «Economic theory». Thesis: «Transformation of economic systems: theory and practice». She was the head and executor of 5 scientific projects. 2018-expert of JSC «science Fund» (expert evaluation of 7 projects). 2016-expert of KKSON MES RK on economic Sciences. 2015-expert of the contest of young specialists » Zhas sarapshy-2015 «(Association» Bolashak», Geneva Business School). 2014-expert of «technology commercialization Center» LLP, Astana (expert evaluation of 30 projects). Publications: 3 monographs (52,6 p. l.), 7 manuals (61,9 p. l.), 12 electronic educational publications; more than 100 articles and reports (40 p. l.) were published. Courses taught: «Economic analysis of the enterprise», «Marketing», «Marketing analysis», «Management», «personnel Management», «risk Management», «Fundamentals of innovative activity of the enterprise», «Economic theory», «Engineering entrepreneurship», etc.